Date day with daughter we headed to the theatre for a production of ‘Snow White’. Rewind to 2010 and Emily and I were involved with Northern Stage’s anniversary project #40babies where a living book was created and captured from bump to three years old so Northern Stage Newcastle always holds fond memories. Fast forward to 2016, When I asked Emily if she’d like to go and see a ballet and that it was Snow White she bounced around the room shouting, ‘yes please mummy’. The production is by balletLORENT a leading UK contemporary dance company based in Newcastle upon Tyne, which regularly tours the UK. This version of was very far removed from the Disney version Emily is used to and akin to the darker side of the tale by Brothers Grimm which I’ve always preferred. So it was familiar to one of us but completely foreign to the other which led to lots of questions. The set was simply beautiful and yet simplistic and was so adaptable throughout the whole production and was moved this way and that with what seemed like ease. The words by ‘Poet Laureate’ Carol Ann Duffy and a score by Murray Gold accompanied by balletLorent dancers and children from local primary schools took us to a magical place throughout the show. The score moved me lots and really hooked the emotion and the narration was fitting, dark in some parts and light and funny in others. The Queen (Caroline Reece) creates a doll and she wanted to make a child in it’s likeness and the King was happy to oblige and baby Snow White is born (first divination from Disney as the Queen in Snow White’s Disney is ‘Evil Stepmother’ rather then Snow Whites mother). Children and adults alike come and greet the child. Alas soon after the King dies. The beautifully vain Queen is deeply saddened as well as the rest of the kingdom. As the child turns from a baby (depicted by a doll) into a little girl (we loved how this was shown in the set but don’t want to give it away) then into a young woman (Natalie Trewinnard) the Queen shows her daughter the good things in life until she starts to see that the beauty of her daughter is now over taking her own. The modern dialogue mentioning hair dye and facelift made Emily and I laugh lots. Here enters the magic mirror depicted by an exceptionally flexible dancer (Gwen Berwick) mirroring every move and told the Queen that her daughter was more beautiful. Her vanity could not cope with this at all and even though she had brought her daughter up in love she now could not bare for her to be on the planet. The huntsman was sent to kill Snow White, the Queen is shown to eat what she thought to be heart of Snow White was a little intense. No dwarfs but seven ‘stunted’ miners who like the dwarfs where in play and disliked the presence of Snow White at first but grew to love her. With many more twists and turns along the way this is definitely a story worth telling. Caroline Reece had me captivated and conveyed the part of a withering beauty with aplomb where as Emily loved Natalie (Snow White) although she was less than impressed that she ended up with the Huntsman and not, ‘a handsome prince’, whoops maybe I shouldn’t have said that? 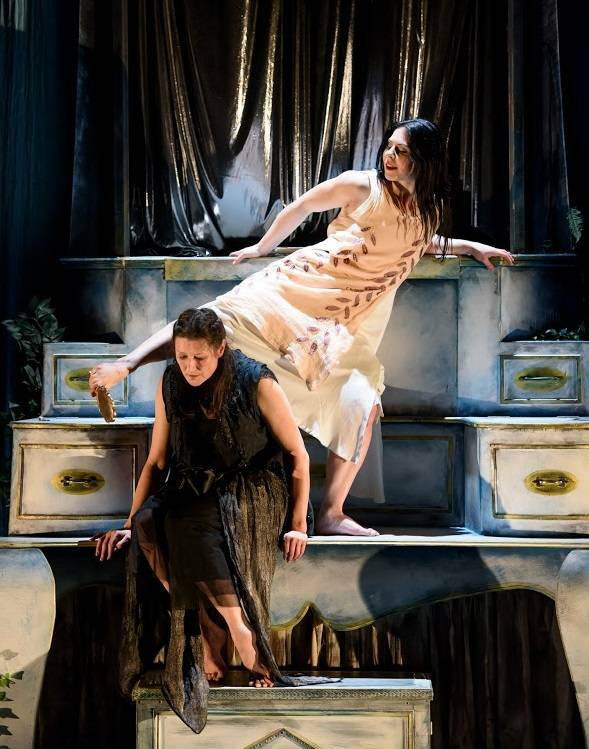 The main actors where perfect but my eyes were continually drawn to one of the female dancers named Giulia Coti Zelati and the young girl partnered with her, their connection was lovely and it reminded me of Emily and I which made me smile on the inside. We really enjoyed our our time and can’t wait to see what is next in store with balletLORENT and Northern Stage. Over the years we have seen many fabulous productions and can’t wait to see many more in the future too, infact our next visit is on Tuesday 5 April to see ‘Need A Little Help’.